270 pages | 45 B/W Illus. Discover how to design innovative learning environments that increase student ownership so they can achieve at high levels and meet rigorous standards. 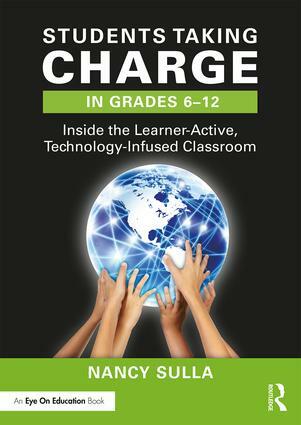 Students Taking Charge shows you how to create student-centered classrooms that empower learners through problem-based learning and differentiation, where students pose questions and actively seek answers. Technology is then used seamlessly throughout the day for information, communication, collaboration, and product generation. Build the facilitation strategies that will move students from engagement to empowerment to efficacy. This new 6–12 edition offers a more detailed look into secondary school implementation. With the book’s practical examples and step-by-step guidelines, you’ll be able to start designing your innovative classroom immediately! Nancy Sulla is an author, national speaker, and thought leader in transforming learning environments to build student engagement, empowerment, and efficacy. As the creator of the Learner-Active, Technology-Infused Classroom™ and founder of IDE Corp. (Innovative Designs for Education), Dr. Sulla leads her educational consulting firm in the pursuit of equity-focused instructional design, positioning students to change the world. Learn more at nancysulla.com.